The evenings at Shechen Monastery were, for me, rather special times. 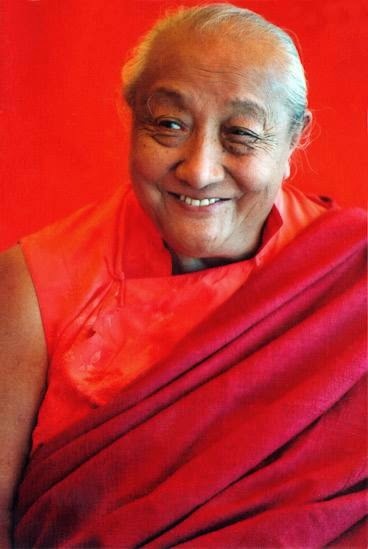 Khyentse Rinpoche would be sitting in his wooden meditation box, usually with a group of Lamas and devotees around him, his vast form glowing in an almost unearthly radiance mixed with the soft rays of the sinking sun. Shafts of sunlight would filter in through the yellow curtains, casting a golden light across the room. Butter lamps flickered on the altar and the smoke of incense wafted about in the still air. There was a silence in those evening, an ambiance of grace that permeated the whole atmosphere. During those hours i always had a sense of absolute contentment. In his presence, nothing was missing, the world felt utterly complete. The atmosphere around Khyentse Rinpoche was never static, it always felt 'full' to the point of saturation and yet, at the same time, intensely charged and deeply silent. This flow of giving was natural, un-contrived, and inexhaustible. It was like a bottomless spring that gushes forth into a parched desert, and the thirsty world came to drink from these pristine, blessed waters. I remember one evening, after the sun had set and there were only a handful of visitors and a few Lamas milling about in the large ante room. Rinpoche was, as usual, in his meditation box and perusing a text, a pair of small reading glasses delicately balanced on his nose. The silence of that moment between day and night had permeated the place with a feeling of great peace.